There’s just so many competing elements here that it’s hard not to be overwhelmed. An announcement of candidacy? Check! Something vaguely resembling a policy on Operation Stack? Check! Wishing England well in the Rugby World Cup? Sure! A photo with a former rugby player? Why the hell not? Things really hit a crescendo with this incredible piece of work that demanding people stop hitting women and Frank Bruno. On top of this, we’re treated to an offer that Fergus would let you touch his championship belt if you promise not to hit women. What the hell is going on? And then, just as suddenly, the ads stopped appearing. Surely nothing could stop this incredible individual from his campaign to take control of Kent’s police? Well, an unfortunate spot of legal bother could. You’re not allowed to be a Police & Crime Commissioner if you’ve been convicted of an imprisonable offence, and as Fergus punched an estate agent in 2013, he’s unable to hold the post. Given this ad talks about the Police & Crime Commissioner election, goes through the Operation Stack routine again, and proclaiming “back me or sack me”, the impression is given that Fergus Wilson has given himself the role of Police & Crime Commissioner without any silly election. 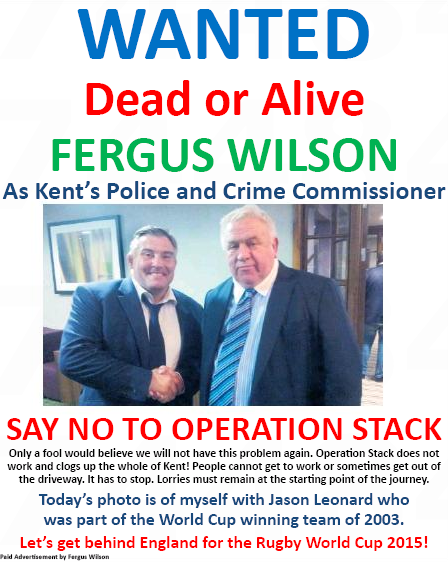 In the coming weeks, we’ll be looking at the current state of Kent’s Police & Crime Commissioner candidates, because Fergus Wilson somehow isn’t the most bizarre. Who does this man think he is. In today’s Kentish Gazette he is stating “As Police and Crime Commisioner I have to enforce the policies of the day regarding immigration. I do not make the policies” . He is not the Commisioner. God help us if he gets selected. Next PostNext The Week in Medway Politics: Candidates, housing, and buffets.